I heard you guys like reviews, so here’s one. 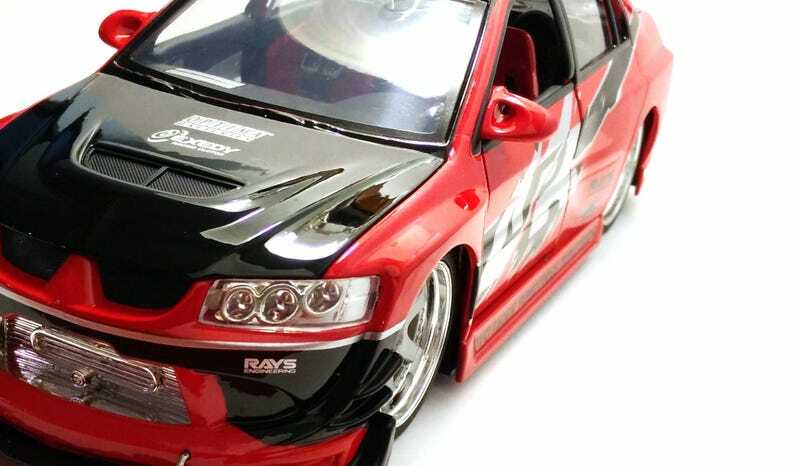 This is Jada’s 1/18 Mitsubishi Lancer Evolution, the one that Sean drives in Fast & Furious: Tokyo Drift. I found this one at TRU for $29.99, which is a more reasonable price than what Target sells these for ($34.99). As you would expect, it’s Jada-fied, so it’s blinged out in some sense. Additionally, it’s a reused casting, thus the bodykit and wheels don’t match the movie car. The first thing that I noticed on this model were the wheels. I thought they were going to be chrome, but I was pleasantly surprised to see that the spokes are silver and the only chrome is in the lip. We’re all tired of chrome here, but I must warn that you will see more below. I think this model looks much better in person than it does in pictures. Also, it’s pretty evident I need a larger lightbox. My current makeshift one is only good for 1/64 as I don’t have large poster board, so the red is darker in these photos than it should be. With that being said, I will go get some tomorrow as I’m going to need them for other things as well. The rims look really nice on this one despite the offset. It’s close to those on the movie car, but the centers should be dark grey. And you know Jada always nails the brakes. The quality is the usual. Some panels and tires could fit better, and the spoiler could be straighter, but it’s nothing concerning for a $30 model. I quite like the interior; it has more detail than I expected even though I generally don’t care for it. Is it movie-accurate? I’m not sure. I’ll have to go and rewatch the movie to find out. The engine is just a giant mess of chrome. Meh. I keep it closed anyways. Oh, and so is the trunk. Overall, I was excited to find this one, and I’m excited to have it now in my collection. I’m hoping one day I can find the 1/43 by Greenlight to pair with this. Is it better than the GT-R? I don’t think so. But if you like F&F and/or tuners, you might want to check this out.